Okinawan shishimai is usually performed by two dancers: one controlling the front legs and head, the other minding the tail end. There are festivals, and then there are special festivals, including Sunday’s 28th Shishimai Festival, which keys on the traditional lion dance. The Shishimai Festival taking place at the Uruma City Agena Bullfight Arena Sunday evening beginning at 6 p.m. is free, and worth making time to experience. The lion dance is a dance to keep the bad spirits away and bring good fortune. This dance is commonly done Aug. 15th of the Chinese calendar, which coincides with Sunday. Lion dances vary in style from region to region, and Sunday’s festival gives visitor a chance to see many of them at one place. In this event, lion dances from different cities and towns from Okinawa will gather and show off their skills, hoping it leads to the lion dance preservation, continuation and progress. Japan also has a tradition of lion dance throughout the nation, dancing in pace with the music. Known in Japanese as “Shishi-mai,” the roots of the Japanese lion dance are said to be from China. The style of dancing and design of the lion differs by region. The lion dance has been completely absorbed into Japanese tradition and is used even in religious Shinto festivals aside from new year celebrations. The Japanese lion consists of a wooden, lacquered head called a “shishi-gashira”, literally, a lion’s head, and a characteristic body of green dyed cloth with white designs. It can be manipulated by a single person, or two people, one of whom manipulates the head. As with Chinese lions, the make of the head and designs on the body will differ from region to region, and even from school to school. 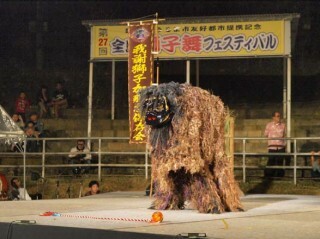 In Okinawa, a similar dance exists, though the lion here is considered to be a legendary shisa. 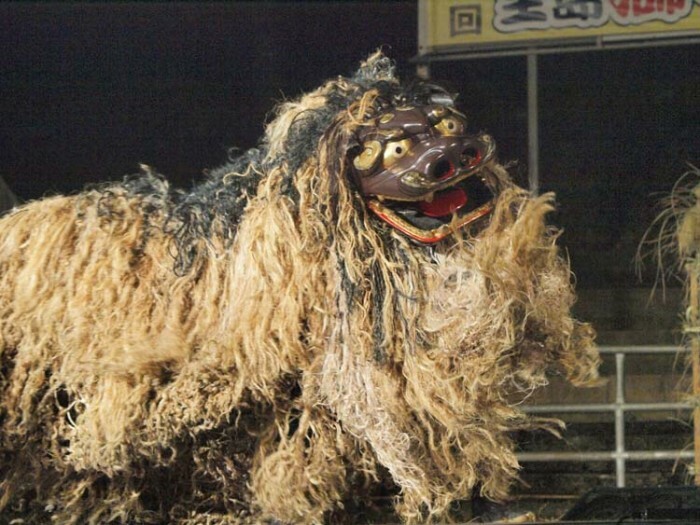 The heads, bodies and behavior of the shisa in the dance are quite different than the shishi on mainland Japan. Instead of dancing to the sounds of flutes and drums, the Okinawan shisa dance is often performed to folk songs played with the sanshin. The Shi-Shi-Mai, the Lion dance, is known to have the power to ward off evil spirits and summon the god of harvest and wealth, bringing prosperity to the region. The tradition has been passed for generations everywhere in Okinawa. Uruma City, for example, is home to Shishi-yama. Lion Mountain, where lions are said to have once lived. The lion dance equipment is stored in seven different districts of the Uruma City area, which explains the city’s familiarity with lions. This festival is an opportunity to give exposure to Okinawa’s various lion dances as well as those of mainland Japan. In fact, a few groups are invited every year to introduce to Okinawans their vigorous and dynamic art.